In high school, I had a copy of this board game designed by Marc Miller of Game Designer's Workshop (GDW), and I've gotten back into it lately (in a big way). 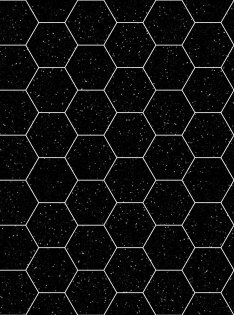 It is a space combat game where the ships move in a fairly realistic 2D approximation of Newtonian physics. 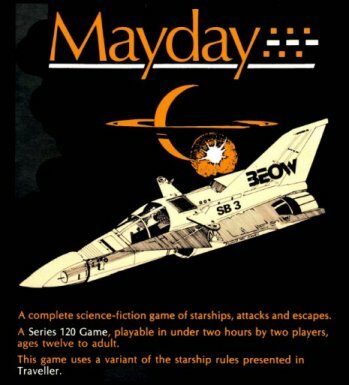 Christer Karlsson has created a great "Gamebox" file for Mayday so it can be played via email using Cyberboard. Here is Christer's page with lots of other Gamebox files. Here is some more info about Mayday. The original rules, map and counters are on the Classic Traveller CDROM from Far Future Enterprises. I wanted to make some changes to Mayday's counters and board, so I modified Christer's Gamebox file. Mayday uses a vector movement system in which there are three counters on the board for every moving object, representing its past, present, and future positions. 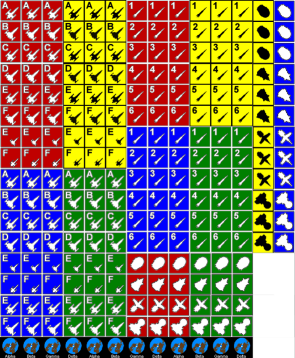 When you start firing missiles, there are a LOT of counters on the board, and usually several hexes contain more than one counter. 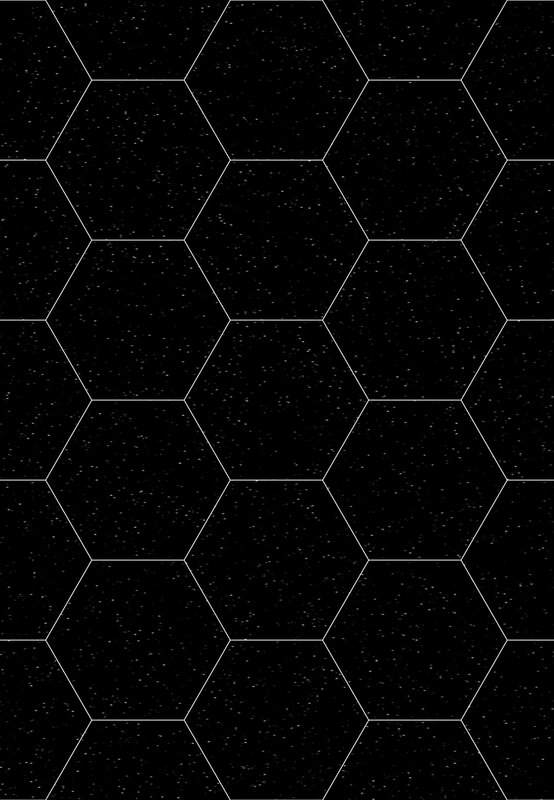 To the Gamebox file, I added a game board with larger hexes so you can easily see multiple counters in the same hex. 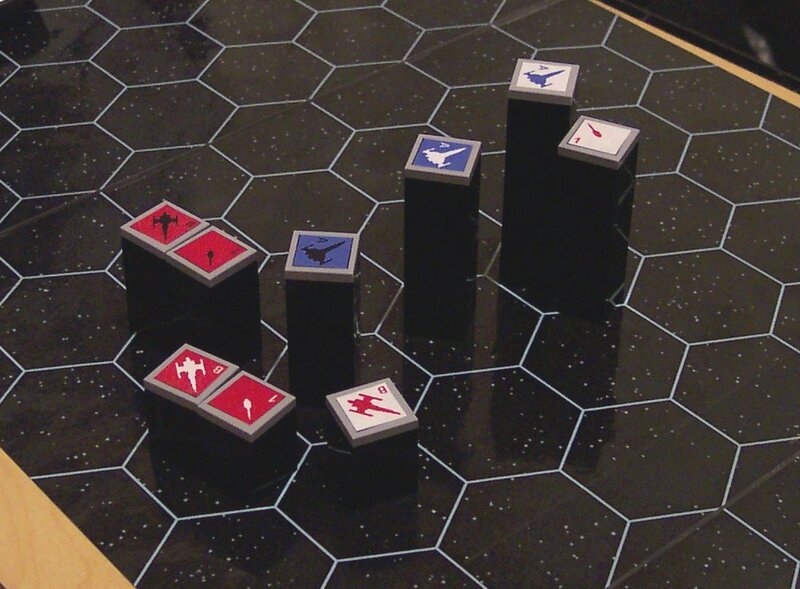 I made a lot of new counters by copying and modifying Christer's images of the original Mayday counters, adding blue and orange to the original green and red starship/missile counters (to allow for up to four players) as well as "E" and "F" lettered starships. I made some of the round "small craft" counters into mini versions of the starships (to make cooler representations of the small fighters described in the instructions), and made three-color past-present-future counters for the large ships. I was thinking it would be cool to have tankers moving in orbit with which you would need to rendezvous to refuel your fighters. 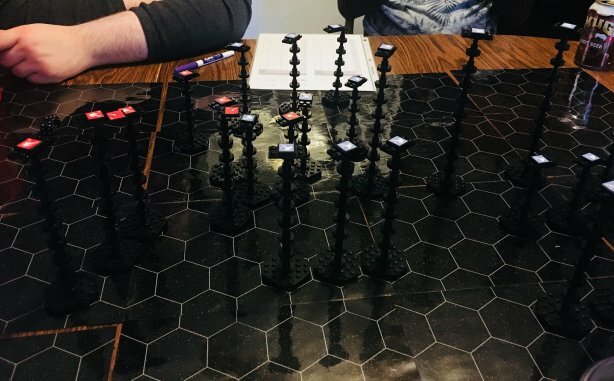 For playing the game in person with a real board, I created these board sections with HexDraw. 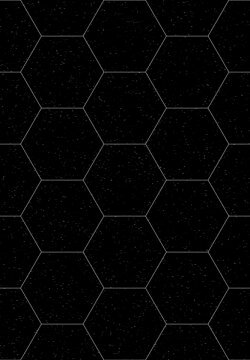 If you print this image file out so it is exactly 10.5" tall, then trim off the white margin with scissors, you will get a board section with 1.5" hexagons that can be placed or taped next to other identical sections to make a large gaming area. 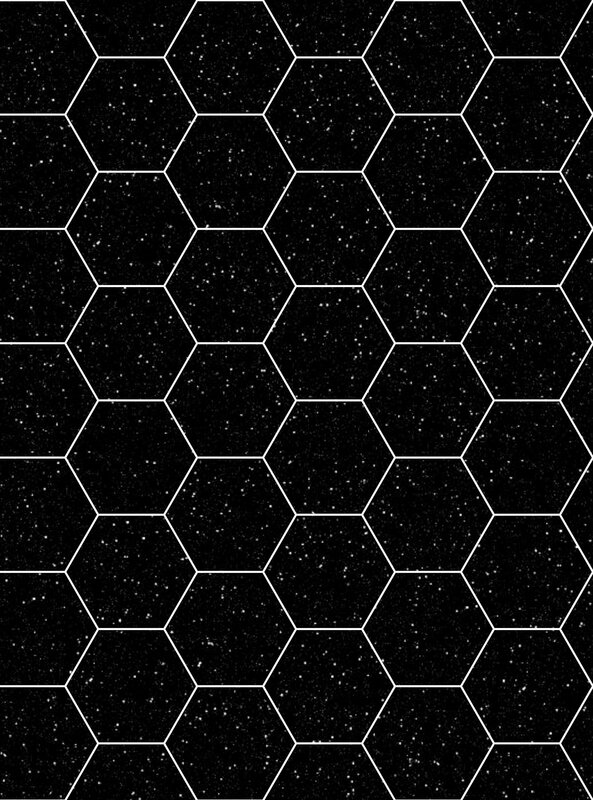 If you print this image out so it is 10" tall, you will get a board section with 2" hexagons. Here are my modified Mayday counters for Cyberboard. I recommend printing the image out on a sheet of full-page 8.5 X 11" peel-off label paper so it is exactly 10 inches wide, so you will get a grid of 1/2" square labels. Then spray the counter sheet with with this stuff, cut out the labels, and stick them onto blank white 1/2" game counters like these. In Mayday, you can cast sand to create a cloud around your ship to impede laser fire. 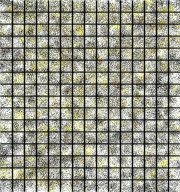 If you print this image out on overhead transparency plastic so it is 7.5" wide, you will get a grid of 1/2" counters you can cut out and put on top of ship counters to indicate that they are in a sand cloud. Here is a way to make Mayday into a 3D game using LEGO blocks. I stole the idea from Darell Phillips, who uses Duplo blocks to represent the altitude of miniatures for the game Attack Vector: Tactical. See here. Cool idea! 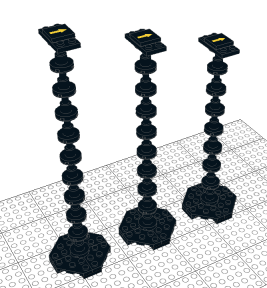 You can attach these to stacks of regular black 2x2 LEGO blocks to show altitude. Here, the red ship is in a slow climb and the blue ship is in a steep dive. Incorporating the third dimension into the game is straightforward. Use the following table to find the 3D range between two counters based on horizontal range in hexes and vertical range in levels. The table was generated using the Pythagorean Theorem, with the results rounded to the nearest whole number. This is very similar to how it's done in Attack Vector: Tactical. 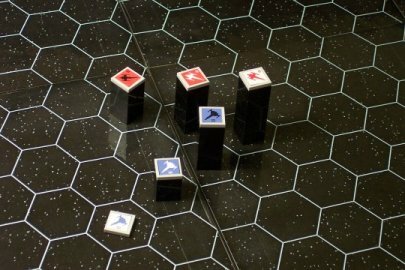 For example, in the above image, the red and blue present position counters (white-on-red and white-on-blue respectively) are two hexes apart on the hex grid, so the Horizontal Range is 2. The blue counter is only 2 blocks above the board while the red counter is 4 blocks above, which means the Vertical Range is 2. Based on the table above, the 3D range between the counters is 3. Here, the red ship was diving but is now leveling off. 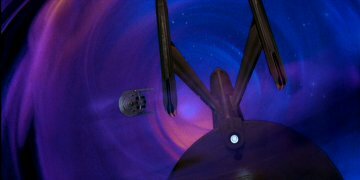 It has just launched a missile at the blue ship, which is climbing. My friends and I have played several 3- and 4-player games with this system and it's pretty cool. An additional benefit of using the LEGO blocks is that the players who have been killed off can entertain themselves building stuff out of LEGOs while they're waiting for the rest to finish the game. This method of 3D could also be applied to Triplanetary. 3D LEGO Mayday Version 2! Here is a better method. The octagonal platforms are used as bases for stacks of 2x2x2 "space stands". These can be built much taller without becoming unstable. Different counters in the same hex can be shown by removing the pole from one base and attaching it to the other. 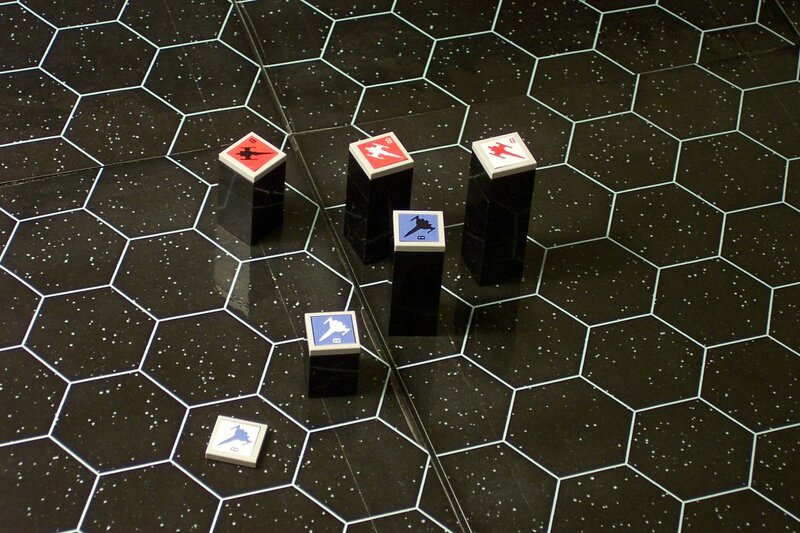 The 2x2 ship tiles are put on 2x4 plates so that missile counters can be added easily when someone fires at the ship. The counter that was the future position becomes the present position. The counter that was the present position becomes the past position. The counter that was the past position gets moved ahead of the present position counter and becomes the future position. The direction of movement is indicated by the facing of the counters. This method can also be used in 3D by adding and removing LEGO pieces from the poles when moving the past position counter pole to the front. 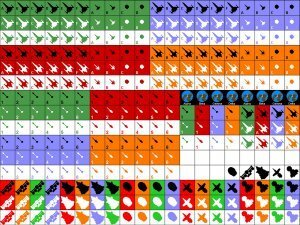 In this animation, each frame represents one game turn. The ship is diving steeply (at two levels per turn), then turns left and climbs more slowly (at one level per turn). 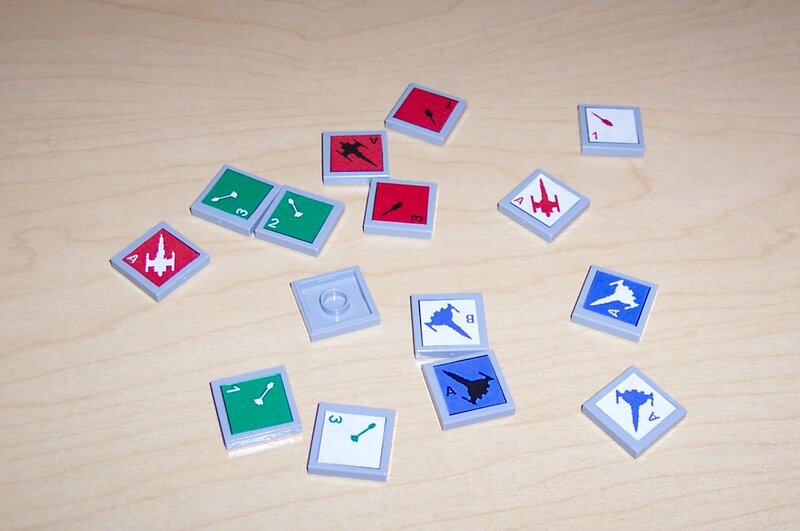 So here are some new counters that are in groups of 3 with identical symbols for use with the leapfrog method. I have also made them larger (9/16") and easier to read from a distance. Here is a picture of our first game with the new 3D counter system! 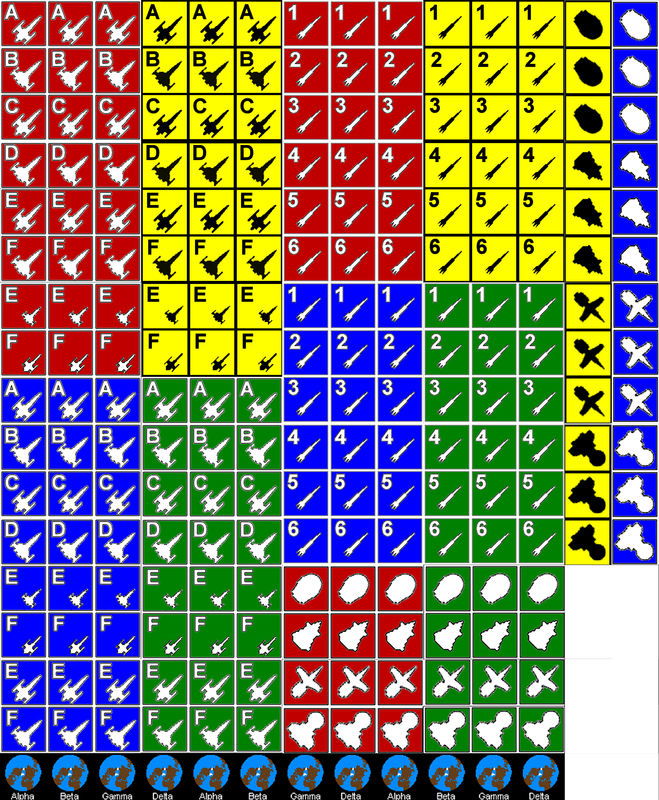 There are 8 ships and one missile.